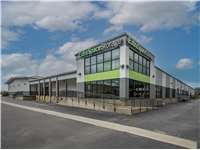 Charlotte Self Storage at 3308 South Blvd. Located near the intersection of South Blvd. and Clanton Rd. just east of Hwy. 21, Extra Space Storage serves Charlotte residents near Colonial Village, Brookhill, Dilworth, and more. Locals will recognize our facility near QuikTrip east of Super 8 Motel Charlotte Downtown and Rodeway Inn. We're also accessible for residents of nearby apartments, such as Hollis House Apartments, Fountains Southend Apartments, Colonial Reserve at South End, Sedgefield Apartments, and Park Place Apartments. Are you a college student in Charlotte who needs summer storage or storage while studying abroad? Extra Space Storage is about 3 miles from Queens University of Charlotte, so we're an accessible option! Extra Space Storage on South Blvd. offers a large selection of storage units and convenient amenities like climate-controlled storage. We're your go-to solution in Charlotte! With unit sizes ranging from 4x4 to 25x10, it's easy to find the space that fits your needs at our Charlotte storage facility. Unit features include indoor access, first-floor access, and more. Store valuable belongings with peace of mind at Extra Space Storage. Our South Blvd. storage facility has 24-hour video surveillance throughout the property to keep customers and their items safe. Concerned about storing temperature-sensitive belongings? With climate control, there's no need to worry. Your unit stays safely between 55 and 80° year-round, protecting your items from Charlotte's heat and humidity. Climate-controlled units are available in sizes 4x4 to 25x10. Extra Space Storage strives to make self storage easy, affordable, and reliable for customers. Not only do we maintain a clean, secure facility at all times, but we also have a friendly, professional staff of storage experts who are more than happy to help with whatever you need. We're dedicated to delivering excellent customer service. Contact us today to reserve a storage unit in Charlotte! I love the company itself. Its prices have always been very affordable. The gentleman that walked me through the process was very helpful and knowledgeable. I had a great experience. Fantastic customer service, great facility, and competitive pricing. I am very happy with this storage solution for my small business. Thank you!! I showed up & bingo! I was in. Friendly informative staff answered all my questions. Best part of my day. Good customer service. Clean and nice storage. When we needed to take our house back and make it a home again and not a storage unit for our semi grown kids Extra Space was great! And when my business expanded suddenly and I needed space to store my extra supplies they were great! Always clean and I feel relatively safe on the property. Extra Space in Southend Charlotte is a great facility. Friendly and helpful staff, clean and has great security features. The transition in to the facility took only a few minutes and had a chance to look at unit prior to completing the transaction. I would highly recommend this location for your storage needs. Great customer service. Climate controlled units kept at what one would expect for room temperature. Very convenient hours. Safe location. Ground level storage units are awesome; no need for elevators. The staff, Alicia and Brian are very helpful and friendly. The office and storage space is very clean. The price was well within my monthly budget. The staff was courteous, the facility modern, safe and inexpensive.second time I've used extra space this year! nice facilty. be careful enrolling in autopay. you will have to buy their insurance. bring your own overhead light. good location. very clean facility. very nice, helpful staff. rate was competitive. in my opinion, those are the variables you try to hit. i'm happy. Brandon was very helpful and answered all my questions from start to finish. He walked me to the unit and showed me where to load and unload. He also made sure my code worked to get into the building. The facility is well lit, clean, and organized. I would definitely recommend this storage company to anyone looking from short to long term! Keep up the great job! We were moving within NC and needed a storage space as we were also downsizing tremendously. The Staff & Extra Space Storage, (ESS), is wonderful. Especially after we had been to 3 other storage fa- cilities in Charlotte & were quite disappointed with the facilities, price and customer service. ESS in Charlotte was professional, courteous & very helpful. The facility is very clean. Staff is friendly and knowledgable. Super simple and easy moving into my unit. Awesome service and great units that are well worth the price which can't be beat! Good customer service and nice facility safe and secure. Very convenient for apartment/condo folks in the area south of Uptown. Great staff, very clean and secure. Everything you need in a storage space. I have had two interactions with this facility. First with Bassy, Second with Michael. Both experiences far exceeded my expectations for quickness and competency. WELL DONE. GREAT TEAM! Great facility to store you home. The staff is great!!! Excellent condition,excellent customer service,excellent price and very clean. Felt understood and respect and valued. Had told family about this storage place if you ever need go there. This facility is very clean and the staffs are very friendly and helpful. You won't regret Storing with extra space. Great customer service, awesome price and very convenient. Bessey Edem was exceptionally helpful and took far more time than necessary in order to make sure I was entirely satisfied with my move in. He reviewed any questions or concerns I had in great detail and exhibited a very high level of professionalism. He went above and beyond my expectations and is truly a wonderful ambassador for the Extra Space Storage brand. I live in another part of the state, but needed short-term storage in the Charlotte area. I feel confident with the choice to store at ExtraSpace. I feel they are very professional and will make sure my belongings are safe. This is the cleanest and safest-feeling storage building I have ever seen!! The customer service is also top notch. The representatives went out of their way to make us feel comfortable. The staff was extremely helpful from the first day I inquired about a unit. They could answer all my questions. I found the facility clean and secure.I would recommend this company to people who need extra storage. At intersection of South and Clanton, next to Blume Supply Inc. along Charlotte Light Rail. Drive southwest on South Blvd. Pass Publix and continue straight. Turn right at the railroad tracks. Our facility will be directly ahead. Drive north on South Blvd. Pass Walgreens and continue straight. Turn right onto Hartford Ave. Turn left onto Weston St. Turn left onto Greystone Rd. Turn left onto South Blvd. Turn right at the railroad tracks. Our facility will be directly ahead. Drive northwest on East Blvd. Pass Starbucks and turn left onto Kenilworth Ave. Turn right onto Ideal Way. Turn left onto South Blvd. Turn right at the railroad tracks. Our facility will be directly ahead. Drive southeast on Clanton Rd. Cross Bill Lee Fwy and turn left onto S Tyron St. Turn right onto Foster Ave. Turn right onto New Burn St. Turn right onto South Blvd. Turn right at the railroad tracks. Our facility will be directly ahead.